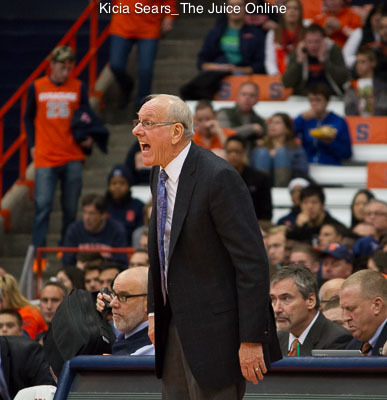 Tuesday night, Syracuse gave up a 14-2 first half run to Virginia Tech and spent almost all of the remainder of the night trying to get even, eventually dropping an 83-73 road game. The Orange (10-7, 2-2 ACC) got the game down to one possession at one point in the second half, but the Hokies (13-3, 2-2) immediately responded with eight straight points to gain some breathing room and held off an SU rally in the late minutes. In the two preceding games, Syracuse had shot almost 48 percent from three-point range, but managed to connect on under 30 percent of their shots from deep against VT. Virginia Tech spent most of the evening turning the zone defense of the Orange inside out, making just over 49 percent of their shots, including just under 54 percent in the second half. The Hokies also owned transition, outscoring SU in fast break points, 19-0, including 17 after halftime. In the opening minutes, Syracuse took a 5-2 lead, but VT answered with a 14-2 run to grab control at 16-7 with just under seven minutes elapsed. After each team added two points to their side of the ledger, the Orange ran up nine straight points to knot the score. Taurean Thompson scored on a quick inbound pass under the Hokies’ bucket, then Andrew White III set up Tyus Battle for three on the left wing. Frank Howard banked in a runner, then White III used a rhythm dribble to knock down a mid-range jumper from the right baseline, tying the game at 18 a side with just over nine minutes left in the opening half. Virginia Tech immediately responded with a 9-2 run to retake the lead. White II ended that run by swishing a three from the left wing, then made both ends of a one-and-one trip to the foul line to pull SU within 27-25. Two straight buckets pushed the Tech lead to a half dozen, but White III finished a strong drive down the left baseline and Thompson punctuated a transition trip by trailing and getting a jam to make it a 31-29 game. The Hokies scored on their next three trips, but White III made a reverse lay-up to get Syracuse within 37-31 at halftime. Thompson added a bank shot on the first SU trip after the break, but Virginia Tech hung eight straight points for a 45-33 lead just three-and-a-half minutes out of the locker room. The Orange replied with their own 8-0 run. Battle started the streak with a turnaround jumper in the lane, then White III cut into the lane for a lay-in. 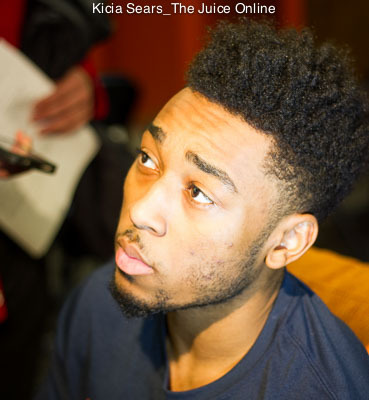 John Gillon zipped a pass to Thompson for another dunk, then scooped in a left-handed shot to make it a four-point game. The Hokies stretched the lead back out to eight points, but Battle found Tyler Roberson behind the VT press for a lay-up then banged home a three from the right corner on the next possession to draw Syracuse within 51-48 just before the midpoint of the half. Once again, Virginia Tech ran off eight straight points. The Orange opted to use their full-court press a couple minutes later and the Hokies took advantage, pushing their lead to 15 points. SU, however, had one last run in them. Gillon started it with a pair of free throws, then Roberson followed a VT free throw by tapping in a missed shot. Battle hung in the lane on a drive to make a short shot to pull the Orange within ten. After a Tech dunk, Gillon walked the ball up and buried a three. Thompson made one of two from the line on the next possession, then Roberson cleaned up another miss. The follow brought Syracuse within 74-68 with 1:33 on the clock. After the Hokies got a pair of foul shots, they beat the Orange down court after SU missed threes on their next two possessions, netting a lay-up and a dunk for an 80-68 lead, effectively ending the game. 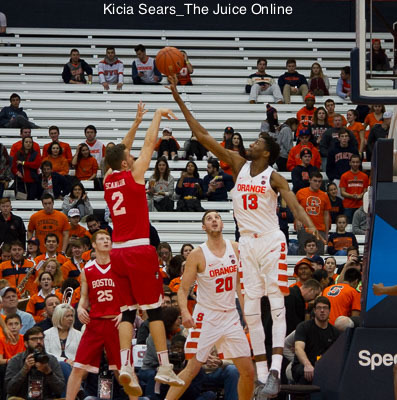 In his first extended action in three games, Taurean Thompson was effective on offense, leading the Orange with 18 points, and also blocked three shots. Andrew White III had 15 points for SU with 13 coming in the opening half. Tyler Roberson had a double-double, finishing with 14 points and a game-high ten rebounds. 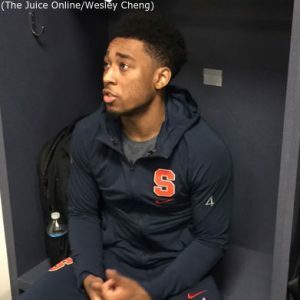 Tyus Battle buried three triples for most of his 13 points. Zach DeLay tortured Syracuse from the baseline, making 9-of-13 shots on the way to a game-high 22 points for the Hokies. Justin Bibbs had 18 points while Chris Clarke added 17. Ahmed Hill chipped in with 13 points and Seth Allen was the fifth double-figure scorer for Tech, adding 11. SU returns home on Saturday and will be looking for a measure of revenge in a return game with Boston College. The Eagles (8-8, 1-2) routed the Orange in the ACC opener for both teams less than two weeks ago, handing them a 96-81 defeat. BC made 16 threes in the game, led by Ky Bowman, who drained seven triples en route to 30 points. Boston College has dropped a pair of conference games since topping Syracuse and takes on North Carolina State on Wednesday before their visit to the Carrier Dome. Saturday’s tip-off is slated for 4:00pm Eastern and the game will be televised regionally, as well as streamed online at ESPN3.com. Would you rather have Syracuse consistency, or UConn’s titles?